The longest blockade of an Israeli trade ship in American history has now spread to a second city. 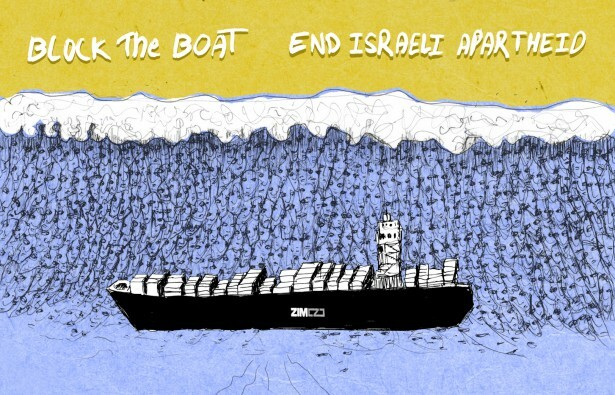 Earlier this month, after demonstrators spent four days peacefully blockading the Oakland port to prevent the unloading of an Israeli cargo ship, the Block the Boat for Gaza campaign has spread to the Port of Tacoma in Seattle, Wash., and Los Angeles, Calif., as the campaign gains traction. So far, four blockades have prevented three different Israeli ships, from docking. The Zim Piraeus was stopped at the Port of Oakland, the Zim Haifa in Long Beach, and the Zim Chicago in the Port of Tacoma and Seattle. The blockade in the United States is the longest blockade of an Israeli trade ship in American history, and it is one small piece of the broader Boycott, Divestment, and Sanctions movement against Israel and its military occupation of Palestine. The campaign was a response to Israel’s latest military operation in Gaza, which ended after seven weeks on Tuesday and left more than 2,100 Palestinians dead, the vast majority civilians. The boats are managed by Zim Integrated Shipping Solutions, the largest shipping firm in Israel. Though some goods have been unloaded from this ship during the blockade, demonstrators and supporters have claimed #BlockTheBoat to be a successful show of the effort to boycott Israeli goods in response to Israel’s escalated aggression this summer.